But this inability to relax before people is, I feel, a sign of a lack of social fulfillment which is also a larger problem in society. Working in hierarchical reward and punishment structures, we only know how to behave with those ‘above’ or ‘below’ us. This system saps us of our instinctive need to relate with a oneness and getting fulfillment, a quality of sahajta, a natural acceptance of the other. Anyway, the important point here is that Narendra Modi is a politician and prime ministerial candidate; he will have the eyes of the nation on him all the time. A political leader affects and influences the mood of the nation with his very demeanour. The nation has suffered a despairing and listless mood because of Manmohan Singh’s wimpish demeanour. When Rahul Gandhi comes on television, he muddles his way through interactions with people, and creates a mood of dullness in the whole drawing room. 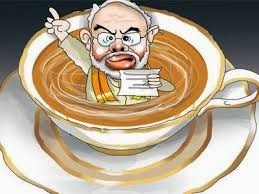 Modi, in his interactions at ‘chai pe charcha’, was stiff and bureaucratic – he gave standard babu-like answers to issues, there was no creative spark in him. He spread his own discomfort into our drawing room. Remember how Shri Anna Hazare moved and inspired a whole nation? Such a demeanour is not cultivated, it cannot be practiced or imitated, I feel it comes from an inner confidence, from an inner clarity, from an inner simplicity. Synonyms: obsequious, sychophantic, excessively deferential, subservient, fawning. It is sad that our politics and bureaucracy, and indeed our private corporations, are so colonial in their structure. It is so mercilessly hierarchical that you are a brute and dominate those under you, and at the same time you are servile and subservient to those above you; such a system itself begs to be transformed.